DCSD is looking for your personalized input (anonymous) on Special Education services. This is your chance to provide feedback, rate services, and be heard by the district. Superintendent, Dr. Thomas Tucker, joins first DCSEAC District Board Meeting of the school year! Superintendent, Dr. Thomas Tucker, came to DCSEAC’s first District Board Meeting of the 2018-19 school year. During the meeting, Dr. Tucker first asked the group for their questions, and spoke candidly about his philosophy that ALL students need and deserve a proper education in Douglas County. He feels strongly that all students on IEPs must have their needs met, and encourages parents to take the Douglas County School District Special Education Task Force: Parent & Staff Survey (for more information, click here). In addition, Dr. Tucker covered the district’s need for additional funding via the Bond/Mill Levy override on the November ballot. He spoke to how greater compensation and professional development for teachers and staff would greatly aid in filling positions such as special education teachers, EA’s, transportation staff, and counselors for all students. If you would like more information on the Bond/Mill Levy, please click here. DCSEAC meetings do not permit personal agendas, but Dr. Tucker asked all parents to talk about their student/s on IEPs. His warm and attentive demeanor allowed members to share triumphs and struggles. It was a great honor to meet and learn more about our district’s new leader, and we would like to extend our appreciation to him for coming. 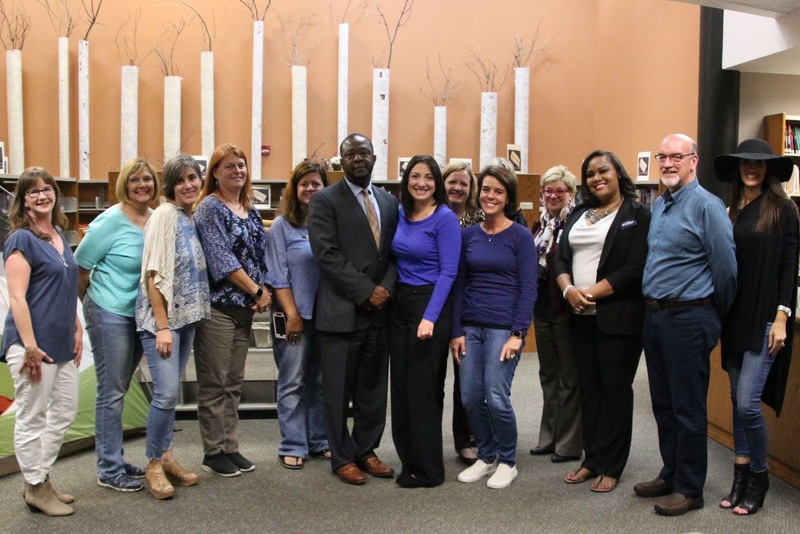 From left to right: Kerri Tompkins (DCSEAC), Janis DeBaca (Developmental Pathways), Tricia Zabelin (DCSEAC), Sabrina West (DCSEAC), Kirah Johnson (DCSEAC), Dr. Tucker (DCSD Superintendent), Kara Lewis (DCSEAC), Sarah Cannon (DCSD Director of Personalized Learning), Melina Depasse (DCSEAC), Lynnette Steinhoff (DCSD Director of Personalized Learning), Danielle Kombo (DCSEAC), David Ray (DCSD Board of Education Director), Alisa Creamer (DCSD Special Education Coordinator), not pictured – Nancy Ingalls (DCSD Personalized Learning Officer), unable to attend – Robin Evans (DCSEAC) and Marisa Ala (DCSEAC).